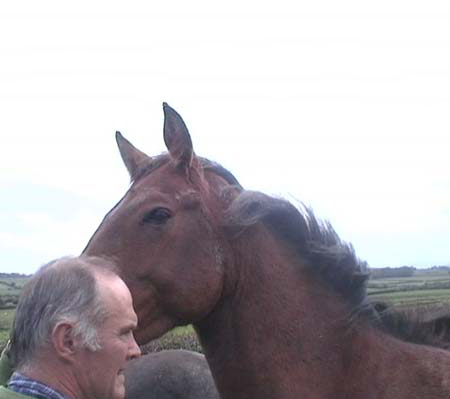 I had brought this three year old horse by Gino in for breaking and had indeed had him driving in the long reins. One morning on going out to feed him I found him standing at the back of the stable with many cuts and tears and the horrific injury to his leg. The little wall built diagonally across the corner of the stable to accommodate his feed trough had been demolished. I can only assume that at some time during the night he had become cast, while kicking in an attempt to get up he must have kicked through one of the blocks and got his leg jammed through the hole. He must then have struggled for several hours to do the amount of damage he did to himself. When I saw him he had stripped all skin and flesh from a good four inch length of his near hind canon bone. The bone and tendons were clearly visible and indeed one tendon was mashed against the bone. I was easily able to reach into the hole and pull it away from the bone. He could not put his foot to the ground at all. I immediately sent for the vet who, when he saw and examined the injury, immediately suggested putting him down. I disagreed and said we would give him a chance. He dressed the leg and said he would return in three days to see if there was any progress. In the course of the next day or two I recalled having been told of a pony with an extensive leg injury which had been healed using Botanica cream. I contacted the owner of the pony who put me in touch with yourself who dispatched the cream to me without payment, I had it the next day. I immediately began to treat the leg with it and did not have the vet back. Within a week there waas a marked improvement and I then called the vet back and he was also very surprised at the obvious improvement and healthy appearance of the wound. By the time I had used two tubs of your cream, following your directions, the wound had closed over and healed externally though there was still a considerable disfiguring swelling. I put him out and the swelling has not only decreased dramatically as you have now seen but he is trotting and cantering completely sound, though I will give him until Christmas before bringing him in again to finish breaking. In the meantime I have used the cream on all sorts of cuts and injuries and it has never failed to promote rapid and scarless healing. I have, as you know, recommended it to several other horse owners in the area and my yard will certainly never be without a tub of Botanica. Multi-directional trigger system for inflation and safe release of the rider everytime. Safety with Style. Specialist helmets and protective clothing for boarding, skiing and other snowsports. Botanica International is a natural herbal range developed to treat common skin conditions. The Herbal range contains a combination of Aloe Vera, Tea Tree Oil, Comfrey and Oil of Lavender, all of which have proven beneficial properties.